We are saddened by the news that Andrei Zelevinsky passed away on April 10. 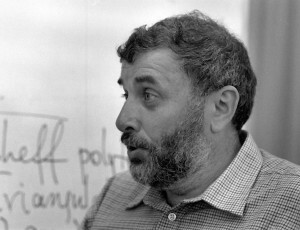 Andrei was best known for his work with Gelfand and Kapranov on “Discriminants, Resultants, and Multidimensional Determinants” and for the introduction with Fomin of the theory of cluster algebras. There is a conference in his honor planned in just two weeks. We will update this post if there is any change to that plan. update: The webpage for the conference says that the conference will continue as previously planned, in memory of Andrei. This entry was posted on Thursday, April 11th, 2013. You can follow any responses to this entry through the Atom feed.